An old screenshot of a tumblr argument that visually represents why tumblr’s design is the worst. Who can follow this kind of conversation? I hate Tumblr. I’m sure that many of you who have been reading my blog for a long time already know this. I think the site is designed in such a way that it creates confusion and friction rather than facilitating good discussions. To the right, you can see an example of exactly why the site’s design is so awful. This is an old screenshot from 2015 that I found on my computer again recently. I made this image and shared it with a few people privately, but I didn’t post it anywhere because I didn’t want anyone to feel like I was picking on them or talking about whatever the actual content of the discussion underneath these usernames was, which I no longer remember at all. It isn’t important. But notice how it looks. It doesn’t look like a conversation, it looks like a labeled bar graph. In order to really follow this conversation, to know who exactly is saying what, you’d have to scroll up and down with your mouse on each of the lines to match up the username with the text. And trust me, it was a veeeery loooooong conversation, with each post being pretty substantive, so that was a lot of scrolling. That isn’t the only problem, of course. With conversations decentralized, it’s difficult to even see other parts of the same conversation topic going on, so you have to click through a lot of notes—sometimes many thousands, most of which are just likes and reblogs—in order to actually see the full range of responses that a post spawned. I don’t have an answer for that problem, other than to wish that a better site would come along that could actually compete with tumblr, and spark a mass migration to the new platform instead. It will happen eventually, I’m sure. It’s happened many times before. 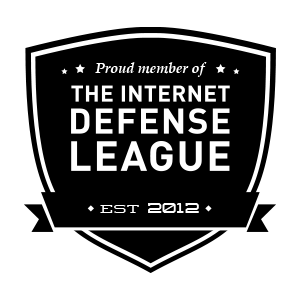 (Hardly anybody still uses MySpace or LiveJournal, and AIM is about to be shut down for lack of use too.) It will take someone coming up with something better, and then lots of time and dissatisfied users. 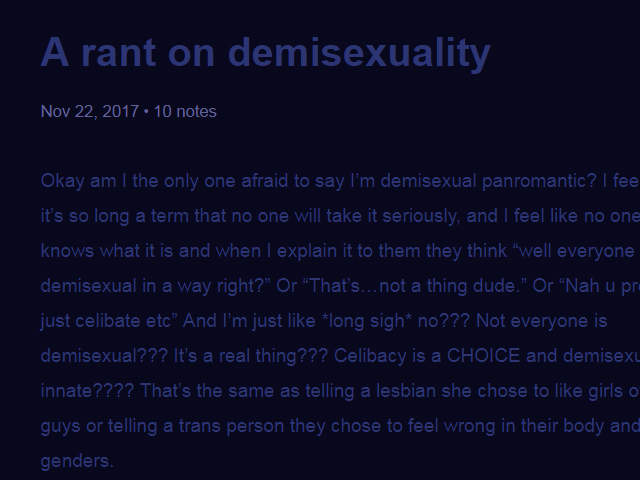 Until then, I’m going to be stuck reading a lot of things posted on tumblr, because such a huge portion of the asexual community resides there. So for now, I’m just going to share a little trick that I eventually learned to help manage reading these blogs as someone who has vision problems. A screenshot of a post with unreadable navy text on a black background. Click to enlarge. But first, here’s a little context about what my visual issues are, because I’d like it if maybe I will have to resort to using this trick a little less often in the future. So many blogs out there just aren’t accessible to me, because I have bad eyesight. Any website that has white text on a black background is basically unreadable for me, because I am so sensitive to light that the white lines burn into my brain and create an after-image that pretty much just gives me a headache. And sometimes the text color is so similar to the background color that I just can’t read it at all. This submission to the most recent Carnival of Aces has… uh, I guess navy or dark grey text? …on a black background. (I’ve included a screenshot as well in order to future-proof this post. In the thumbnail, I can’t even tell that there’s any text there.) How can anyone read that except by highlighting the text? I don’t understand why these colors were chosen unless the point is that it’s unreadable. Maybe it’s an attempt to keep people from being able to read over your shoulder? That’s my best guess. Another problem is font choices. I’ve seen people use fonts that are so tiny and blocky that without zooming in on the page I wouldn’t be able to read them anyway, but then on top of that they also have added extra white space between the letters, which makes it much harder to differentiate between words. I don’t have dyslexia, but I imagine that it would be especially hard to read sites with fonts like that if I did. Mostly, I chalk all of these things up to website designs made by young people with excellent vision who are just not thinking about making their blogs readable for anyone with visual accessibility issues. This can be an intentional thing. If you’re still young enough to have parents, teachers, siblings, and others nosing into your business all the time, it can make sense to strategically choose a style that they can’t read. Especially if your parents are abusive. However, since Tumblr’s dashboard doesn’t actually use the style that you set your own blog to have (unlike LiveJournal’s friends list—and I think that was a good feature, since it allowed you to choose whatever is most comfortable for you to look at), this only makes sense if you’re looking at your own blog directly. It won’t work when reading anyone else’s posts, unless you’re reading it as a reblog on your own page. I think that the dash being in a totally different style may contribute to a lack of consideration for non-tumblr-users reading blog posts. Again, when so much of asexual community discussion is happening on tumblr, it’s a serious accessibility issue particularly for older people, who are more likely to have vision problems and less likely to know how to use the site. The ace community consistently skews young—86.9% of respondents in the 2015 ace community census were 30 or younger—and this is one reason why that trend continues to be reinforced. If you type /embed/ after the post’s URL, you will get a readable version of the post! That submission that I linked to above now looks like this. Voila! Example #1 of the difference between the default web view and the view when using /embed. 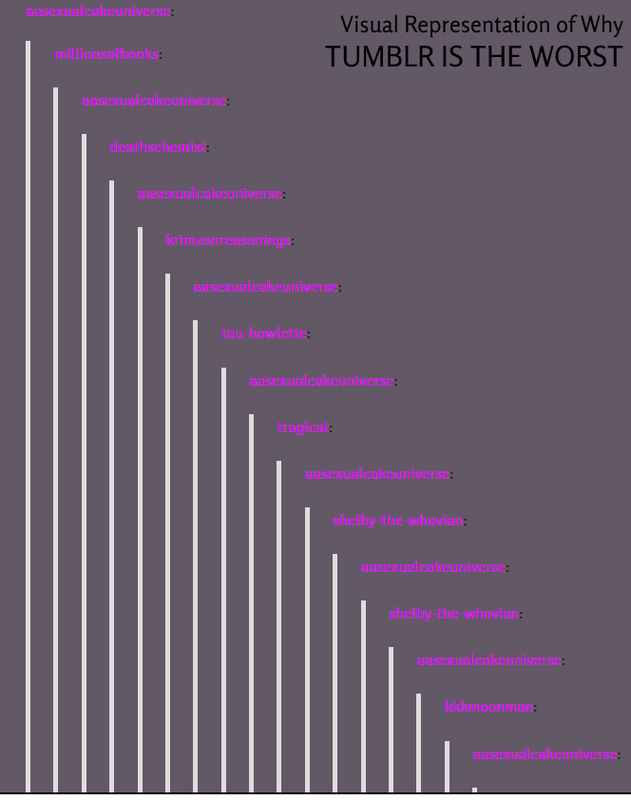 And it works for the terrible reblog threading issue, too. Here’s a neutral example from redbeardace’s recent posts, since I happened to be looking at his blog already while writing this. The usernames now sensibly appear directly above the comment that person made, with horizontal lines between the posts. Example #2 of the difference between the default web view and the view when using /embed. I don’t understand why, if the dashboard and the embed options present posts this way already, that isn’t incorporated into the site design by default. It’s a terrible decision. But tumblr staff are always making terrible decisions that users don’t want. So what can you expect? And as far as I know, no theme allows you to opt for this style, either. If you know any other little tricks for making tumblr more accessible, not just visually but in any way, I’d love to hear them, so please feel free to share what works for you! Even if I don’t have the same problem, it might be useful to someone else reading this. Well these examples and clicking on the links aren’t working for me because I’m on my phone at the moment. This means it redirects to a white background black text version on my mobile app by default and I have to try pretty hard to see what you mean. I’ve never heard of the embed trick though!! I’ll have to try it! What I’ve tried I’d actually the, when on the computer, “mobile” trick. Ah right, I should’ve thought of the mobile layout making the examples impossible to see. I’ve added some comparison screenshots so you can see how it looks from your phone now too. I didn’t realize that you could add /mobile on a desktop. That’s a neat trick too! I’ve never actually seen the mobile layout because for some reason when I try to load tumblr on my phone I usually just get a blank page. I suspect the browser on my phone is no longer supported. (I REALLY need a new phone, lol.) I suppose it’d work better if I actually downloaded the app instead of trying to use a web browser, but eh. I just tried /mobile and it’s not as well-optimized for a PC as /embed (the text goes to the edges of the screen, so I have to resize the browser window to read it comfortably), although it’s good that it does change it to black-on-white, that really helps. It does the same weird bar graph thing as the default view though, unfortunately, though it’s easier to read because you have to do a lot less scrolling. It’d probably work pretty well for a tablet (assuming that doesn’t already default to the mobile view anyway?? ), but on PC /embed is probably better in the case of too many reblogs. I checked on a PC to see more of what you mean and yeah, I think embed works better than mobile for what I was trying to do. Thanks for adding extra screenshots too! About the “why, if the dashboard and the embed options present posts this way already, that isn’t incorporated into the site design by default” question: The default current theme for tumblr blogs does have stacked comments like the dashboard, but since most themes were created before the update of September 2015 that implemented that change, they still have the, umm, boxes within boxes layout. And yet another alternative, this time using New XKit: If you install the Go-To-Dash extension, you get a lil eye icon along the like and reblog ones that let you see that post in your dashboard— though only if follow that blog. That option also allows you to read the other replies that may exist for that post, either by clicking the notes or via the ReplyViewer XKit extension (dunno if there’s a difference other than visuals between them, because the ReplyViewer is older than the March 2016 update so it may serve the same function). It’s theme-dependent? :psyduck: Well, that’s one way to negate the positive design changes! Lol. Well, it’s good to know that at least there’s some options now. That’s neat that there’s a reply viewer thing available! This is only while logged in for blogs you follow though right? I’m usually too lazy to actually log in, though I suppose I really should set it up and use it sometimes. I did set up XKit at some point, though I don’t remember if it’s the new version or not.